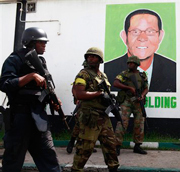 Civil unrest erupted in Jamaica on May 23 when Prime Minister Bruce Golding ordered a joint police-military operation to capture a powerful drug lord for extradition to the United States. Golding, anticipating strife over the arrest of drug kingpin and Robin Hood figure Christopher “Dudus” Coke, declared a state of emergency that night. During a nationally televised speech, he called on the country to “confront the powers of evil,” which he said had earned Jamaica “the unenviable label as one of the murder capitals of the world.” While the violence has largely subsided, concern remains surrounding a manhunt that left more than 70 dead and Coke at large. The government faces a barrage of questions about alleged police brutality and the Golding administration’s prior inaction out of possible fear that Coke could “name names” if extradited to Manhattan, where the U.S. case against him has been built. Even before the extradition request for Christopher Coke was made, critics blamed Golding’s government for the country’s poor economic performance during the global financial crisis. The country was forced to return to the International Monetary Fund (IMF) in February for a $1.27 billion loan to meet its balance of payment requirements. GDP growth shrank by 3.5 percent GDP growth rate in 2009 and is expected to reach just 0.5 percent by the end of this year. To top it off, Golding has governed during one of the worst droughts in Jamaican history, forcing water rationing across Kingston. Jamaica’s financial woes appear to underscore the institutional weaknesses of the government and facilitated the rise of community kingpins. In neighborhoods such as Tivoli Gardens, where the recent turmoil took place, these extra-governmental leaders wield power and are funded by illicit trafficking flows in the Americas. Over the past decade Jamaica has seen a dramatic upward spike in crime, giving it the highest murder rate in the Caribbean. Although Jamaica’s next election doesn’t take place until October 2012, the fallout from Golding’s decision to use force against Coke and his supporters could linger for several months, if not years. Political experts are split as to the prime minister’s prospects for reelection, with some supporters using last month’s raid as an example of his willingness to go after drug traffickers and criminals. But opponents have emerged from across the political spectrum to call for his resignation in the wake of his handling of the crisis. In Golding’s own Jamaica Labor Party (JLP), the calls for him to step down have gown louder. The opposition People’s National Party (PNP) also pounced on recent events to sponsor this week’s no-confidence motion against Golding, who barely survived the 30-28 vote in the House of Parliament. Opposition leader and former Prime Minister Portia Simpson-Miller called Golding a “devalued prime minister in a devalued nation,” alluding to economic woes and drug violence. Americas Quarterly’s Spring 2010 issue covers transnational crime in the Western Hemisphere and its relationship with institutional weakness as a threat to democracy. Global Voices explores the civil unrest and features several video reports from journalists and bloggers inside Jamaica. The New York Times blog The Lede features first person accounts of the situation on the ground in Jamaica. Journalist Laura Redpath’s Twitter feed, in particular, was featured as she offered a first-person perspective. The Economist's coverage of the recent unrest.